Why did I read this book: Ana absolutely loved Victoria Schwab’s first book, The Near Witch, and ever since reading her review of that title I have been eager to give the author a try. When I saw the blurb for this book, featuring a library for the afterlife, I was hooked. There is nothing fresh about this start. Life and death are complicated for Mackenzie Bishop. As a young child, she shadowed her grandfather (affectionately nicknamed Da)’s every move. She idolized and loved his seriousness, his strangeness, and his ability to lie with the truth. From a very young age, Mackenzie is sure of two things: that there is something different about her Da, and that she will do anything to make him proud. Even if that means she must inherit her Da’s powers and become a Keeper for the great Archive – where everyone goes after death, facsimiles of their dead forms containing all the memories of their lives kept in quiet, organized rows in a colossal library of the dead. Every now and then, one of the dead – a “History” – awakens and tries to escape the Narrows to the outside world; it is up to Keepers, like Mackenzie’s Da to capture those Histories and Return them to their slumber. Now sixteen years old, Mac is a seasoned Keeper having inherited her Da’s position and his key. She’s become accustomed to lying to everyone, to shying away from touch, to roaming the Narrows alone and stopping violent, frightened Histories from slipping into the Outer. She’s lost her Da, her ten-year old brother has just died, and her family has moved to a new apartment in a crumbling former hotel called the Coronado. It is here, at the Coronado, that things start becoming strange for Mackenzie. More and more Histories are awakening, and someone has been tampering with memories of the past. The Corondo’s tragic past, its history of murder and sorrow, is at the heart of the mystery, and Mackenzie must discover the truth before the Archive is torn apart. This is the first book I’ve read from Victoria Schwab, and I’m not entirely sure how I feel about it. But I’ll start with the obvious, and the good: The Archived is a beautifully written book, a morose, slow-simmering modern gothic novel, with a truly intriguing premise. Narrated by Mackenzie mostly in realtime, but with quick interstitials of her memories of her Da, The Archived‘s greatest strength is its powerful, moving voice. Mac may be sixteen, but she has enough secrets and careful lies to last a lifetime – believe me when I say that hers is a voice filled with pain and weighed down by the burden of responsibility. I loved and sympathized with Mackenzie’s struggles, her need to keep away from any real and honest human interaction, the grief she feels for the loss of a brother (made so much worse because she knows his memory is kept in the Archive but she must never wake him). The Archived isn’t all doom and gloom, though – in addition to Mackenzie’s dark, elegiac solo, there is hope and brightness in the form of her new neighbor Wes (he of the sculpted hair and guyliner). I loved the lightness that Wes brings to the book, his easy way around others, and the effect he has on Mac as she realizes she does not need to bear the weight of the world on her shoulders alone. I loved the atmosphere of the book, the deliciously gothic setting of the Coronado and its many, many secrets in the past. The Archived is a very visual book too, and Victoria Schwab brings the hotel-turned-apartment complex to life painstakingly, slowly, brilliantly. While these elements are fantastic, there are some in whose efficacy I am less convinced. Perhaps the story moves too slowly and it takes too long to get to the actual conflict at the heart of the Archive. But more importantly than the pacing, the bigger question mark to me is the premise of the Archive itself, the need for Librarians, Crew, and Keepers. 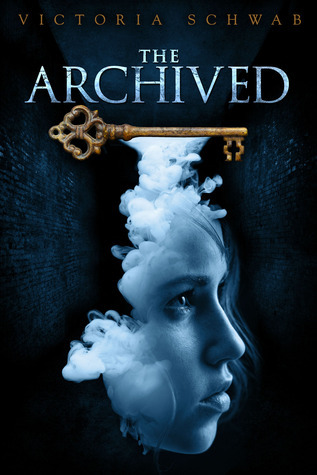 The rationale for keeping the Archive secret makes sense (indeed, if people knew there was a netherworld where Histories are kept sleeping, they would be tearing down the doors in the hopes that they could revive or spend just another day with their departed loved ones). But I’m not sure the actual purpose of the Archive itself makes sense – only Librarians can read Histories, but why would they (it certainly doesn’t seem like they do anything)? For what purpose? The danger with Histories is that they might wake up and violently escape, killing humans before slipping away into the ether forever – but if they were never housed in the first place, they would never awaken, harm others, or slip away. I’m sure (I hope) this is something that will be revealed over the course of the series, but for now, the central concept of the afterlife as a giant library seems…shaky. There’s also a brief, predictable romantic entanglement with two different boys that felt forced and tepid, but in the grand scheme of things, this is a nitpick. Ultimately, The Archived is a good book. I loved its beautiful, atmospheric writing and a its compelling heroine – but by that same token, the story was a shade too loose and sluggish, and the actual premise of the Archive at the heart of the book needs honing. Still, I’ll be back for The Unbound. I lean back against the car and stare up at the Coronado, the hotel-turned-apartment building that my mother and father find “so charming.” It stares back, wide-eyed, gaunt. I spend the whole drive twisting the ring on my finger, running my thumb over the three lines etched into its surface, as if the silver band were a rosary or a charm. I prayed for someplace simple, uncluttered, and new. And I got this. I can see the dust from across the street. “Isn’t it divine?” squeals my mother. So old that the stones have settled, the cracks deep enough to give the whole facade a tired look. A fist-size piece of stone loosens before my eyes and tumbles down the side of the building. I was anxiously awaiting your review, because I’m reading this now. I agree that it’s beautifully written. I love the concept of the Archive and its Histories. But I keep putting it down and picking it up, instead of plowing through it like I expected to do so. The slow pacing and the mixture of backstory help us get to know the characters, but they kept diluting the tension (at least for me). I am terrified to read this book because I love the concept so much and don’t want its potential to be ruined if it turns out not to be good. But from your review, it seems worth keeping on the list, especially because by the time I get to it, the sequel will probably be out, and then if I like it I’ll be able to go straight to number 2.
this book is perfect. Imagine a place where the dead rest on shelves like books.